The official museum of the National Railway Company of Belgium opened only in 2015. In that short time tourists have warmed up to it a lot. The museum tells the story of trains in Europe, particularly Brussels. 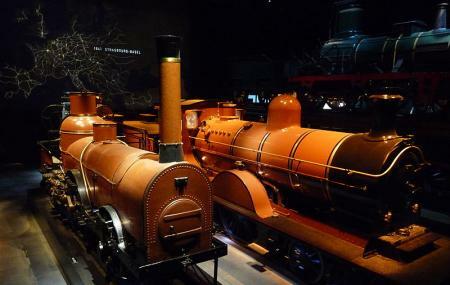 To do that it uses a collection of 22 sparkling locomotives from all across train history. The stars of their exhibit are the Pays de Waes, oldest preserved locomotive in Continental Europe (from 1842), a 19th century railway bridge, and the sceneries of Belgium and Europe recreated here by cartoonists. There are over 1200 items to be browsed and interacted with documents, films, historical artefacts. Check out the train driving simulator. Also, visit the popular attractions in the city by following Brussels itinerary 2 days. You can download the Train World audio guide app. Check out the restaurant and brewery. There are multiple group guided tours (Dutch, French, German and English ), combined with other attractions. Reserve guide tour 3 weeks in advance. How popular is Train World? People normally club together Musical Instrument Museum and Musee Rene Magritte while planning their visit to Train World. Was really a great time! I am not a train person but my husband loves them so I went along, and was pleasantly surprised! Lots of great information! Pretty interactive, and certainly engaging. Make sure you plan plenty of time! It is a very large museum. Really nice and impressive museum to visit, kids had a lot of fun and enjoyed the day and each train. The only thing that could help to get a 5 star experience is if there was kind of a small bar or service for some light eat and drink, just enough to fill in parents with the extra energy to keep up with the siblings. For the rest, the excitement and joy is worth the price. Great experience, really worth visiting! They really did a great effort making this a very fun and interesting visit. All the old train are meticulously restored. A nice visit for young and old! Fun experience, good for kids with enough Lego stuff to keep them interested. It shows a good history of the Belgian railways as well as explaining some of the more technical aspects of trains in simple to understand ways. Particularly interesting for me was the trans Europe express carriage, which is a real front runner in opening up Europe for simple, less cost travel. Nice experience! I'd recommend the tour with audio guide, also bring your own headphones for extra comfort. Going through the whole place takes about 3 hours.